A nuclear-powered underwater drone capable of unleashing two megatonnes of hell to destroy enemy naval bases with massive tsunamis is under development in Russia, according to a state news agency. “It will be possible to mount various nuclear charges on the ‘torpedo’ of the Poseidon multipurpose seaborne system, with the thermonuclear single warhead similar to the Avangard charge to have the maximum capacity of up to 2 megatonnes in TNT equivalent,” a source in the Russian defense sector told TASS on Thursday. 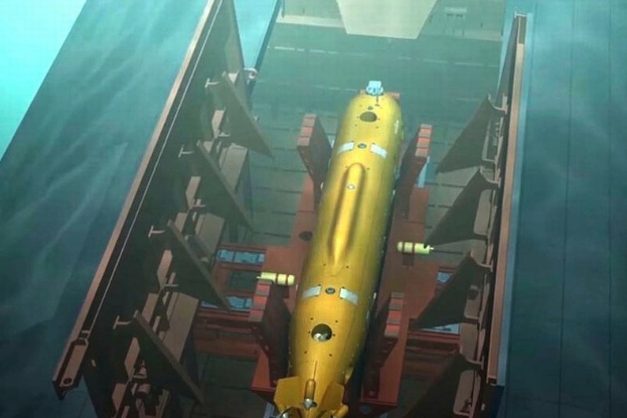 With the drone’s nuclear munition, the underwater craft “is primarily designed to destroy reinforced naval bases of a potential enemy,” the source explained. “Thanks to its nuclear power plant, the Poseidon will approach the target for an intercontinental range at a depth of over 1 km and at a speed of 60-70 knots (110-130 km/h),” another source revealed to TASS. Meanwhile, TASS explains to its readers, “it has no official confirmation of this information,” however, being a government-owned corporation in Russia, it is likely this knowledge is coming from insiders to combat an informational war with the West. “Efforts to contain Russia have failed, face it,” Putin declared in a two-hour speech to the nation, which included computer simulations of new arms including hypersonic systems, intercontinental missiles, and underwater nuclear drones. This is more bad news for Washington, as it appears their strategy to contain Russia through sanctions and expanded NATO deterrence operations along the Russia border have not just failed but backfired. In response, Putin was forced to develop a wide array of new weapon systems that can bypass NATO’s defenses, including hypersonic weapons, and what we recently discovered: nuclear-powered underwater drones capable of unleashing significant tsunamis against enemy naval ports. While TASS does not define who exactly the “enemy” is, we must add, it is the United States. War is knocking on Washington’s door, will the Trump administration entertain its new guest?